This is a tale of two women, both drinks entrepreneurs. Both found themselves out of a job, so they created products in their kitchen that weren't on the market before. But the products are very different -- and so are their business results. Nora Egger creates Elixir floral infusions in Cleveland using natural ingredients; it takes 15,000 rose petals to make a 9 ounce bottle of her Damascan Rose elixir. "I make 40 gallons at a time," says Egger, 33, who was laid off from an international management recruiting job. "We manually fill, sticker, label; everything." Nikki Halibur, co-founder of Adult Beverage Company, doesn't know what kind of vodka goes into Adult Chocolate Milk -- an outside company takes care of that. She knows the milk is shelf-stable, but doesn't know where it's from, what the vodka was made of or how many times it was distilled. 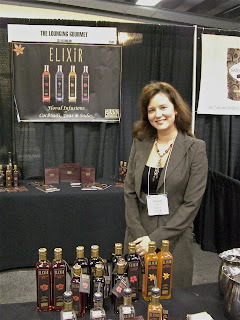 The products taste very different, of course -- the rose elixir is one of the best floral products I've ever had, with a strong rose essence, delicious in sparkling water and just waiting to be used by cocktail experts. Adult Chocolate Milk is also the best of its kind I've ever had. I can honestly say I've never had a better combination of shelf-stable milk, generic industrial grain neutral spirit and chocolate so mild that you can barely taste it. It's like a not so tasty, provocatively named Bailey's Irish Cream. The company's ad slogan invites you to "Re-taste your youth," but unfortunately in my youth shelf-stable milk was still rare, so in order to achieve this beverage folks had to add grain neutral spirit to reconstituted powdered milk. Still, this flavor really might take some of y'all back to the good ole days: red-faced parents lying on the floor, screaming fights at all hours, the sound of shattered glass, Mommy explaining why you can't see Daddy anymore. 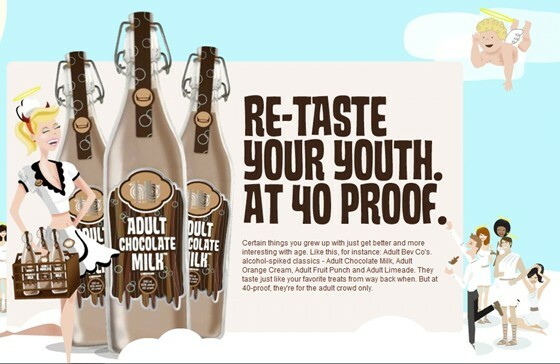 You'll note that Adult Chocolate Milk is already in 300 stores. Halibur told me that after making just 7000 cases in the first three months of production, the company made 8000 cases in January, as the product got national attention, thanks to the fact that it's being trumpeted by a Real Housewife who earned her money the old-fashioned way, by inheriting it. Turn your sound on to check out the website: I like the funky song a lot. Seriously. Meanwhile, Elixir products are barely in stores on the East Coast, and haven't found a West Coast distributor, though you can order directly from the company here. Unfortunately there ain't no party going on at this website; you can practically taste the absence of Hollywood cash. So the moral of the story is, if you want to get attention in the drinks business, don't waste your time sourcing great ingredients or making an artisanal product. Find the right product name and get it to Hollywood, and you're all set. How about obvious? Drinking rose petal extract vs. chocolate? Are you guys from another country? I didn't taste chocolate. Enjoy your beverage. There are beverages (wine, beer etc. ), too many to count, that are great but you wouldn't know they exist because they do not know how to "get into the market". I know personally that 50% of winemaking is is 95% marketing. Just like real estate. "50% of winemaking is is 95% marketing." Or 47.5% of winemaking is marketing? I have to agree somewhat with anon above here too, calling this sobering is a bit dramatic. Being artisinal is expensive and difficult, and appealing and accessible to a very small market (moderate to high income people who have a keen interest in your product type). Failure is the rule, not the exception. Also, just because something is carefully and expensively made does not mean it's good, and just because something appeals to the lowest common denominator doesn't mean it's not tasty as hell. Anon: I don't disagree with anything you're saying, but I think Joe's comment was succinct because the obvious one word to use is "depressing." Just because the US market makes these kinds of decisions doesn't mean we need to celebrate them. Blake, I appreciate how you chose to frame these marketing realities. I too, agree with Joe but not because "sobering" replaces "depressing". Such opposite results should cause us to think alertly and creatively market more effectively. In a word... tonic. Anon - Consider these stories: Ernest and Julio: Our Story written by the brothers Gallo with Bruce B. Henderson and Dr.Vino's blog about Bob Trinchero and the story of White Zinfandel. Beverage marketing is fascinating. Some people "get it" by accident and others on purpose. Choose well. Skol!